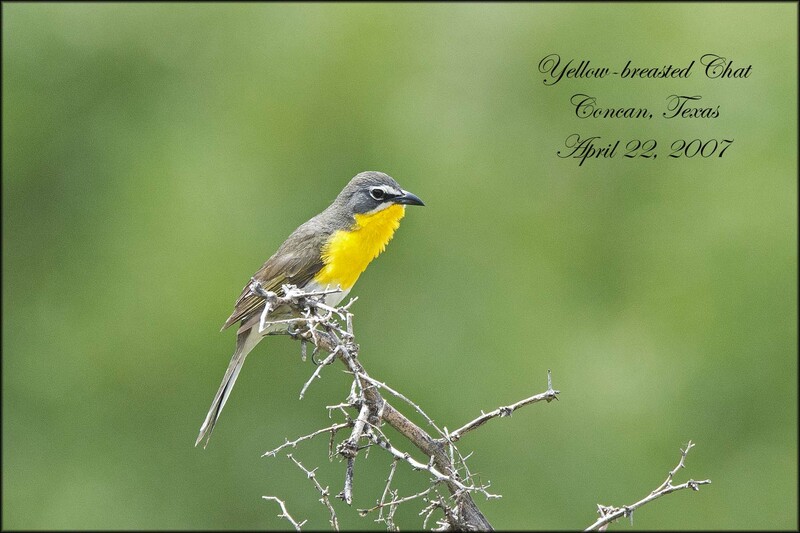 April 22, 2007, was the day I saw my first Yellow-breasted Chat in Concan, Texas at Neil’s Lodge. Since that time I’ve seen at least 10 or more but I’ve never been able to get a Chat photo of any kind. I’ve seen photos people have taken where they are out in the open, singing away. This species became my grail bird: one that I thought I’d never photograph. Fast forward, 2,629 day’s, 16 hours, 46 minutes and 0 seconds, to July 4th, 2014 at 2:11pm. Rick and I pulled into the parking lot of the Boyce Thompson Arboretum State Park in Superior, Arizona. We decided to stop here on our search for Gray Vireo’s. The moment I stepped out of the car, I realized the nearby shrubs were alive with Chat’s doing what they do best……chatting. 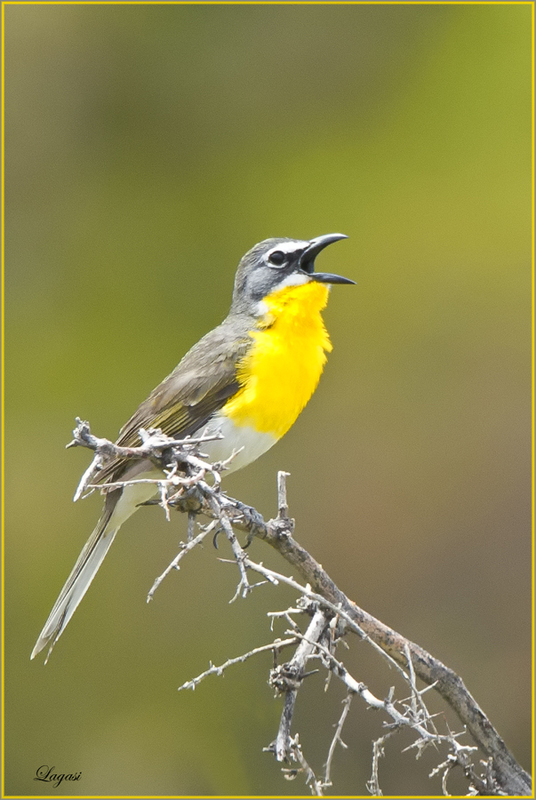 I pulled out my call and played it once and a lovely male flew from the underbrush and just started singing away. I didn’t even extend my lens, I just fired away, for fear the Chat would disappear, like they had so many times before. To my surprise it just kept singing, singing, singing……. Feeling braver I moved a bit closer then remembered I had my Tamron 150-600 zoom, this Chat stayed there for a few more seconds allowing me a perfect broadside pose. Then flew back down into the shrubs, disappearing. Many of you, who’ve birded with me know how hard I’ve tried for this bird……priceless when they oblige. Was the second, close-up taken with the Tamron? Nice! Congratulations on your successful trip. 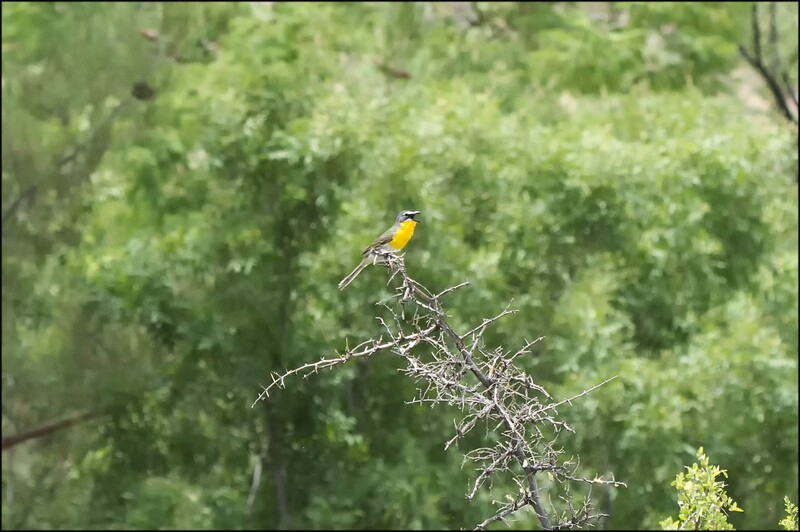 Just realized, of course it is the same bird, on the same branch. Well done! Love the new Tamron. I hope you are enjoying it as much as I am. The Chat photos are great!